I am looking for a specific horse, but I'm not 100% positive that it was indeed a PJ's (but I'm pretty sure it was). It is a large figure, at least 12" to the top of the pole, and the base is also at least 12" long. It is a buckskin horse done in circus/Middle Eastern-looking trappings. 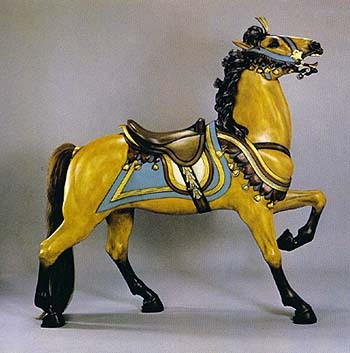 It's basically a copy of the horse shown below (pic is from the Tobin Fraley book The Carousel Animal, photo by Gary Sinick). If you have this horse for sale or even have any information about it (such as the name of the figure), please contact me at webmaster@carouselfigures.com.